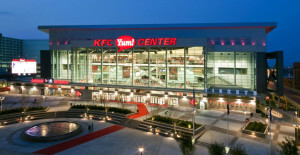 Job Fair coming up at YUM Center. LOUISVILLE, Ky. (Aug. 18, 2014) — The KFC Yum! Center will host a job fair on Wednesday, Aug. 27 from 9 a.m. to 2 p.m. The entertainment venue is seeking to fill part-time housekeeping and two full-time maintenance positions to assist with its busy fall and winter event schedule. Applications will be accepted on-site and interviews will be conducted on the same day. The housekeeping and maintenance team members will be responsible for cleaning and maintaining the arena during sporting events, concerts and family shows. These include the University of Louisville’s men’s and women’s basketball games, volleyball matches and a multitude of upcoming concerts and family shows. The ideal candidates for the full-time maintenance positions will have electrical, carpentry, plumbing and machinery-service experience; however, all individuals with experience in any of these areas are encouraged to apply.